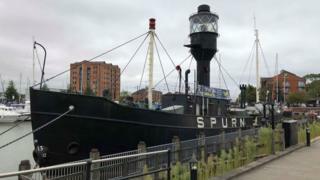 A historical lightship has moved for the first time in 30 years ahead of work to install a new footbridge over the A63 in Hull. The Spurn Lightship moored next to the road was moved to another berth in Hull Marina during the work. The planned Princes Quay Bridge will link the marina with Princes Dock and allow pedestrians to cross one of the city's busiest roads. Work on the £11.5m bridge is due to start next month. The bridge over Castle Street was originally planned to be open in time for Hull hosting the UK City of Culture arts festival in 2017. The vessel was manoeuvred by local marine specialists to near the sail ship HMS Pickle on the marina. It is due to move to a new permanent marina home in 2021, as part of Yorkshire's Maritime City programme. The Spurn Lightship, built in 1927 by Goole Shipbuilding & Repairing Company, served for 48 years about 4.5 miles (7km) east of Spurn Point guiding ships on the Humber estuary. Spurn is a 3.5 mile (6km) long, thin sand spit at the mouth of the estuary. Hull City Council bought the ship in 1983 and restored it, mooring it at the marina in 1987 where it became a visitor attraction. During the move it is hoped further conservation work will be done on the vessel. Councillor Daren Hale, of Hull City Council, said: "The new footbridge and wider plans to the A63 will make a huge contribution to improving traffic flow as well as reconnecting the city centre with the much-loved waterfront and Fruit Market."